Tribulation for Believers - The grievous afflictions, distresses, or burdens that the Almighty uses as a means of destroying the Believer’s “unwanted and unwelcome” prideful spirit. It is administered by Satan, under the authority of the Father, to all those who’ve accepted Jesus Christ as their Lord and Saviour thereby desiring to “take on” the Flesh and Blood of Jesus. And it’s these same Believers in “Jesus Christ and Him crucified” who will likewise experience the “miraculous transformation” of having their “minds renewed in Christ” through this excruciatingly painful “process” of being “crushed, pressed, and squeezed” into the image of Jesus. Tribulation for un-Believers - The grievous afflictions, distresses, or burdens that the Almighty uses as a means of breaking the un-Believer’s desire to retain their prideful spirit. It is administered by Satan, under the authority of the Father, to all those rejecting the Flesh and Blood of Jesus. This excruciatingly painful “process” of being “crushed, pressed, and squeezed” will not bring about a miraculous transformation in the minds of the un-Believers, but only an “agonizing opportunity” for them to give up on “prideful self” by accepting Jesus Christ as their Lord and Saviour. Tribulation (G2347) [thlipsis] - From G2346; pressure (literally or figuratively): - afflicted, (-tion), anguish, burdened, persecution, tribulation, trouble. In fact when it comes to this thing about a “tribulation horror show”, my question to you is “were you able to see the BIG picture through those verses and definition?” I mean were you able to actually “see” all the spooky things that will take place in this upcoming “Great Tribulation” event? – and were you able to “feel” the unimaginable stark, cold terror of it all? Well, I don’t think so!!! So what did you think about that? Can you even imagine a “tribulation curse” such as that taking place for un-Believers? I mean can you picture in your mind a place in time where God would allow things to get so catastrophically out of control that the once delicate, reserved, and non-violent “fathers and mothers” would snuff-out the lives of their innocent children in order to satisfy their fleshly appetites? And if that wasn’t bad enough already, can you even fathom the unimaginably “prideful spirit” that would cause those once delicate, reserved, and non-violent “fathers and mothers” to selfishly guard their cooked “flesh and blood” children much like a snarling, growling, junk-yard dog would guard their dried-up chew bone? So did you get that? God warned his chosen people, the Jewish nation, that “if thou wilt not hearken unto the voice of the LORD thy God, to observe to do all his commandments and his statutes which I command thee this day; that all these curses shall come upon thee, and overtake thee… and they shall pursue thee until thou perish.” And not only did God warn them, but within that same Scripture He also wrote a “hidden Truth” concerning exactly who it was that was going to administer this promised “tribulation horror” on the Jewish un-Believers. Now the means of uncovering this “hidden truth in God’s Hebrew Words” is a phenomenon called the “Bible Code”, and it does it’s thing of “searching and finding” through a mathematical process called “Equidistant Letter Sequences” (ELS). In fact it was something like ten years ago that Israeli scientists at the Hebrew University discovered this incredible phenomenon in the original Hebrew Massoretic Text of the Old Testament. Because when they asked their computer to analyze the different combination of letters within the Hebrew text of the Holy Bible, they found a few meaningful words spelled out at a 22 letter interval in Deuteronomy 10:17-22. 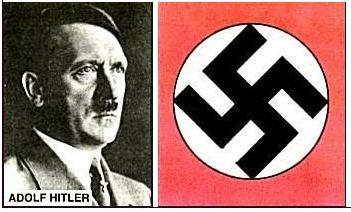 And you see the very “evil” words that they found were none other than Hitler, Holocaust and Eichmann. However, at a different letter spacing within that same passage, they also found Eichmann, King of the Nazis, Berlin, Germany, Holocaust, Cremetoria, Fuehrer and the death camp Auschwitz. And if that wasn’t enough already, the “Bible Code” revealed within God’s “blessings and curses” Scripture (Deuteronomy 28) the words Hitler, Nazi, Auschwitz and World War II. And, as promised, that was just another “taste” of the “tribulation horrors” that God has declared for the rebellious “un-Believers” of this world. 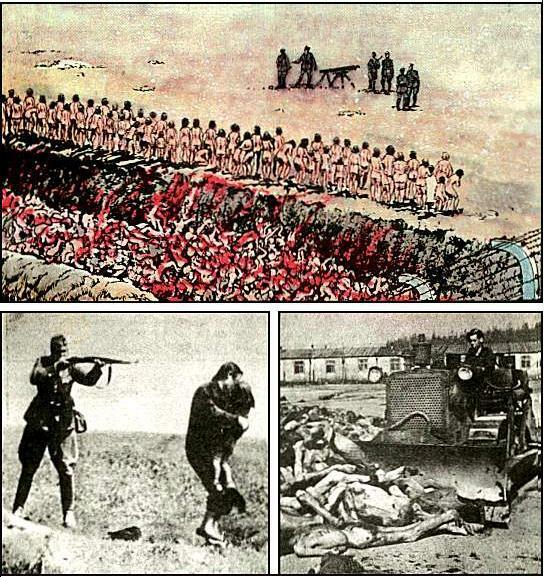 And even though these “pictures” from Hitler’s “death camps” are gruesome beyond compare, they “do not” and “can not” make any of us “feel” the stark terror that was “felt” by the six million (plus) Jews who were shot, gassed, hung, burned, and butchered by “mad-man Hitler”. In fact it wasn’t until my “personal encounter” with a particular “backslidden preacher” that the Father gave me His Divine Proof concerning this up-coming “tribulation horror show for un-Believers”. Because it was during my great adventure with Pastor Stevens And The Rejected Word From God! (5/27/01) that the Lord revealed to me (a prophet) the reasons for both Evangelist Jimmy Swaggart “falling into deep sin with the prostitutes” and Pastor Stevens “believing that Believers will suffer through the great tribulation”. You see both of these “men of God” got all “messed-up and mixed-up in sin”, and all because they didn’t obey God in “all things”! And as it applies to Pastor Stevens, not only did “God so love the world, that he gave his only begotten Son, that whosoever believeth in him should not perish”, but God also continues to give His present-day “warnings” (through dreams and visions) to all those who think they’re believing in Him but yet ain’t! In fact it’s sad to say but there are many “learned men of God” like Pastor Fred Stevens – (the ones who think themselves to be “holy” but yet ain’t) – who have interpreted God’s “warnings to them” as being God’s “revelation for the Church”. …And the way the Almighty gave these very serious warnings to Pastor Stevens was through a few white-knuckle, spine-tingling “dreams and visions”. However, seeing how Pastor Stevens considered himself to be a holy man of God, he didn’t receive these warnings as God had intended. In other words when Pastor Stevens “saw” himself going though the “Great Tribulation”, he interpreted it as meaning that all Believers would suffer through the “tribulation horror show” as well. And, of course, that’s right about the place that Pastor Stevens’ understanding of the “rapture for Believers and tribulation for un-Believers” got all “tangled-up and messed-up” in sin and became “error”! Now before I give you all the details of God’s proof from Revelation 3:10, what do you say we just bog it on down with a deeper understanding of what brought us here in the first place? Because you see for the last six years the Lord’s been showing me a lot about a demon called "Error". In fact in the past six years I’ve had to speak (as a prophet) what "thus saith the Lord" to many pastors in an effort to help them see the error demon in them. And, amazingly enough, it's been a rather high percentage of these same pastors that believe all “Christians” will have to go through the Tribulation Period…and they believe it because God has shown them that they are going to be there!!! Because you see what the Lord showed me is that the seven Churches of Asia (as found in chapters 2 and 3 of Revelation) are representative of the Christian Church of today. And even though God used only seven (7) Churches in His simple little comparison, there was only one (1) of those seven (7) Churches prepared to enter into Heaven. I mean just think about it! Out of all those who consider themselves to be “Believers” there is only a very small percentage of them worthy of escaping the “tribulation horror show” of the upcoming “Great Tribulation”. And that’s what you call some pretty bad odds! Now the way the Almighty showed me “there’s only a very few Believers who have kept the Word of His patience and will be kept from the hour of temptation” was through the two Greek words from which "temptation" and "try" were translated: "I also will keep thee from the hour of temptation (G3986), which shall come upon all the world, to try (G3985) them that dwell upon the earth." Because you see these two words in the Greek – "peirasmos (G3986)" and "peirazo (G3985)" – truly mean “to prove or test”...however, in this particular Scripture they mean “to prove or test” in the worst sense of the word. I mean, after all, that's what the “Great Tribulation” is all about; for God to prove that those going through it were not and had not been transformed into the image of Christ through their obedience to the “Word of His patience”. Temptation (G3986) [peirasmos] - From G3985; a putting to proof (by experiment [of good], experience [of evil], solicitation, discipline or provocation); by implication adversity. - The meaning of peirasmos depends on who is being tempted. If the Believer is being tempted, it is for the purpose of proving their dedication to God. If it is the un-Believer being tempted, it is for the purpose of causing him/her to fall. Try (G3985) [peirazo] - From G3984; to test (objectively), that is, endeavor, scrutinize, entice, discipline: - assay, examine, go about, prove, tempt (-er), try. - To tempt or to prove by solicitation to sin. Prove (G1381) [dokimazo] - From G1384; to test (literally or figuratively); by implication to approve: - allow, discern, examine, X like, (ap-) prove, try. - To prove someone good and acceptable. You see when it comes to this thing about obeying the “Word of God’s patience”, it’s the Greek word for "prove" in Romans 12:2 (“that ye may prove (G1381) what [is] that good, and acceptable, and perfect, will of God”) that “provides the evidence” that the Believer has obeyed it! In other words what happens to the Believer, as he or she walks in obedience to the “Word of God’s patience” (regardless of the pain and suffering encountered along the way; tribulation), is that their “mind” is actually changed and made “new” in Christ Jesus. And of course it’s this thing about becoming a “living sacrifice” on God’s “flaming altar” that actually brings about this “miraculous transformation” in the Believer through an excruciatingly “painful process” of “burning up the Believer’s sinful flesh”. So the difference between "peirazo (G3985)" for the un-Believer [Revelation 3:10] and "dokimazo (G1381)" for the Believer [Romans 12:2] is the difference between having to go through the “Tribulation Horror Show” and not having to go through it. Because you see the “peirazo” kind of testing is designed to prove someone evil by making him/her more evil (like fathers and mothers killing and eating their own children), while the "dokimazo" kind of testing is to prove someone good and acceptable by making them a new man/woman/boy/girl in Christ Jesus. Temptation (G3986) [peirasmos] - From G3985; a putting to proof (by experiment [of good]). Tried (G1384) [dokimos] - From G1380; properly acceptable (current after assayal), that is, approved: - approved, tried. You see what we have in those four (4) little old verses from the book of James is a composite of both the “good” and the “bad” types of “tribulation”. In verse one (1) we see the “Believer” being “tried” (dokimos/G1384) through the “good” type of “temptation” in order to produce the Believer’s “new mind in Christ Jesus”. In fact a very simple formula to help us remember how all this works for the Believer is “the Word of God’s patience + obedience to it = crown of life”. In other words for the Believer who’s willing to hear God and obey God in all things, and regardless of the suffering encountered during the process, that same Believer will be “approved” by the Almighty as a “True Believer in Christ Jesus”. And of course this thing about being “approved” means that the Believer is exempt from having to go through the “Tribulation Horror Show” by means of the “Rapture”. Temptation (G3986) [peirasmos] - From G3985; a putting to proof (by experience [of evi]). Tempted (G3985) [peirazo] - From G3984; to test (objectively), that is, endeavor, scrutinize, entice, discipline: - assay, examine, go about, prove, tempt (-er), try. - To tempt or to prove by solicitation to sin. You see the second part of this “two-part Scripture” describes what happens to the un-Believer when “tempted” (peirazo/G3985) through the “bad” type of “temptation” in order to prove the un-Believer “evil” by making him/her “more evil”. In fact a very simple formula to help us remember how all this works in the un-Believer is “the Word of God’s patience + disobedience to it = sin and death”. In other words for the un-Believer who’s un-willing to hear God and obey God in all things because of the suffering encountered during the process, that same un-Believer will be “un-approved” by the Almighty and forced to take part in the “Tribulation Horror Show”. So, the first “face” we’re shown in this prophetic “Scripture on Mr. Antichrist” is none other than “the Roman Catholic Pope all dressed in white and riding on a white horse.” In fact many years ago the Roman Catholic “protestor”, Martin Luther, had the following to say about the Roman Catholic Church: “The papacy is the seat of the true and real Antichrist…”, and without a doubt, what he said was and is God’s Uncompromising Truth! 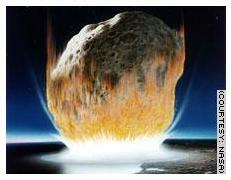 Because as we stated in our sermonet The Roman Catholic Curse In The Passion Of The Christ! 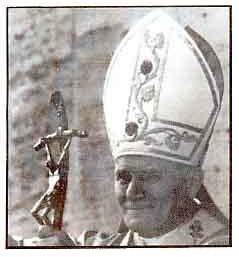 (4/25/04), it is the Roman Catholic’s “White Pope” who not only claims to be “Jesus on earth” (Vicar of Christ) but who likewise presents himself to be “Jesus the Man of peace”. And even though the Roman Catholic’s “White Pope” might look “innocent and peaceful” enough, please believe me when I say “He ain’t!! !” I mean the “White Pope” might not carry a weapon of “mass destruction” (only a bow in hand), but as the Roman Catholic “Vicar of Christ” he has the power to command his army of faithful followers to do the killing for him. And, as history has recorded it, the Roman Catholic Religious System has exercised it’s awesome power of persuasion to cause wars and rumors of war since the early beginning of the Christian Church . 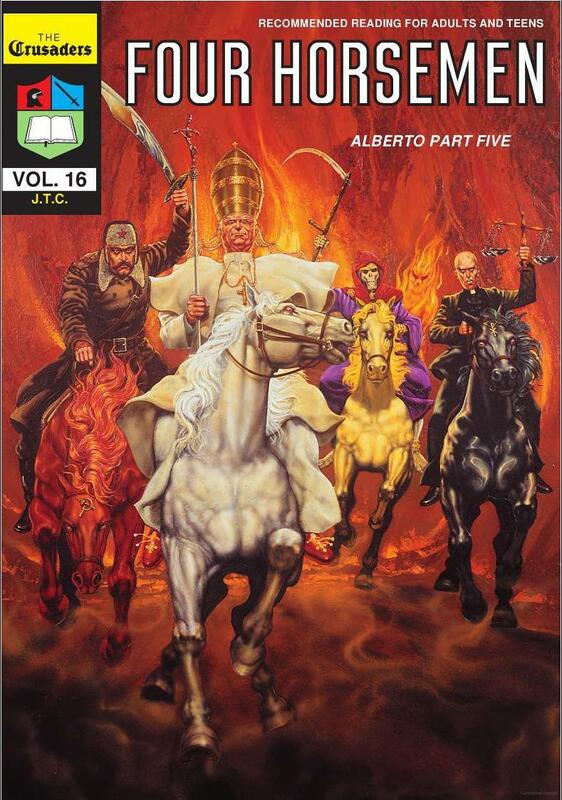 In fact when you get down to the basics, the Roman Catholic Religious System believes that the divine purpose of the “Revelation four horsemen” will be realized as they (the papacy) put in place the “one-world church and one-world government of the Antichrist”. And as it pertains to the “bowed crucifix” carried by the “White Pope”, well, it was intentionally bowed by the Vatican to identify the White Pope with the first “bow carrying” horse-rider of Revelation chapter 6. I mean, go figure!!! 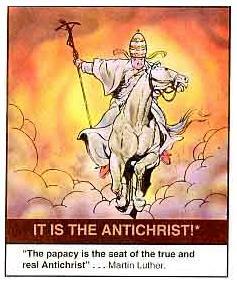 So the first “face” of the Antichrist was the “White Pope” of the Roman Catholic Church. And even though this “Vicar of Christ” claims to come in peace – a bow with no arrows – he has plenty of arrows hidden in the shadows; out of sight, out of mind. You see the “arrows of war” that the “White Pope”/“Antichrist Jesus” will use to force the world into submission is none other than the Communist people of the Communist countries. 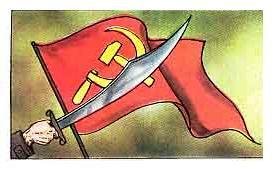 Communism is sweeping the world in preparation for the Antichrist’s one-world government! In fact it was the Roman Catholic “Society of Jesus” (The Jesuits) who helped birth and grow Communism through their super-natural satanic influence (guidance and finances), and all for the purpose of making war. Therefore the second “face” of the Antichrist, as shown by the red horse-rider of Revelation chapter 6, is none other than the Roman Catholic “Communist war machine”. 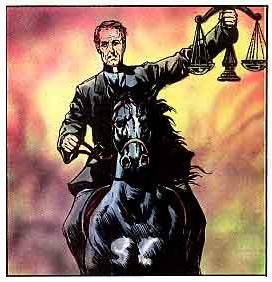 Now in this third “face” of Mr. Antichrist we see a black horse-rider all decked-out in “Catholic black”. And, amazingly enough, it’s the color “black” that symbolizes the Roman Catholic Pope who actually gives the “White Pope” his “marching orders”. You see black is the color of the “Black Pope” because his sole purpose is to take away the real “Light” of the real “Jesus” from the world. In fact to help you understand this “White Pope/Black Pope” thing a little bit better, Satan, in his attempt to copy the Triune God-head for himself (the Father, the Son, and the Holy Ghost), has chosen two earthly humans to represent “the father and son” of his satanic “triune god-head”. And, of course, it’s these two Roman Catholic Popes who will likewise fill these positions in order to do the Tribulation work of the Antichrist. And seeing how the “White Pope” calls himself “Jesus”, it shouldn’t be too awful hard to figure out who’s the “father” of this unholy trinity. In fact when a Roman Catholic takes the vow to become a member of the “Society of Jesus” (Jesuits), they swear allegiance to their leader the “Father General” (the Black Pope) who openly admits to being “The Ghostly Father” of the Roman Catholic Church. But anyway, in the hand of this third horse-rider we see a pair of balance scales (two of them). One scale symbolizes the “Black Pope’s” ability to control the world’s “food production” through the Jesuit’s super-natural power over the world economy, and the second scale symbolizes the “Black Pope’s” ability to protect the world’s “oil and liquor productions” through the Jesuit’s control of national and international laws. So you see not only will the Antichrist of the Roman Catholic Church bring about wars through horseman #2, but he will also cause lots of people to go hungry by increasing the price of food by a factor of eight (8x). Talk about mothers and fathers eating their children!